The library provides students the opportunity for creativity, communication, collaboration and critical thinking. The library aims to support teachers in developing critical and creative thinking, ethical, intercultural, personal and social capabilities of students. Pam has worked in schools, public libraries, run her own online business and also worked at the State Library of Victoria including the Centre for Youth Literature. Her focus is the joy of researching and reading, thus she is rarely found without a new book in her hand. In the other hand is probably a cup of coffee. At MHS she also teaches Extended Investigation. Suzannah has previously taught English both here and in the UK. She draws on her love of reading and appreciation of excellent literature to encourage all students to read and challenge their reading habits by broadening their genre choices. She works closely with English teachers to match students to books for Literature Circles studies. She has a unicorn lunchbox. Catherine in an innovator, researcher and curator. She loves working in educational environments where she can share her information literacy and study skills expertise with students and colleagues. 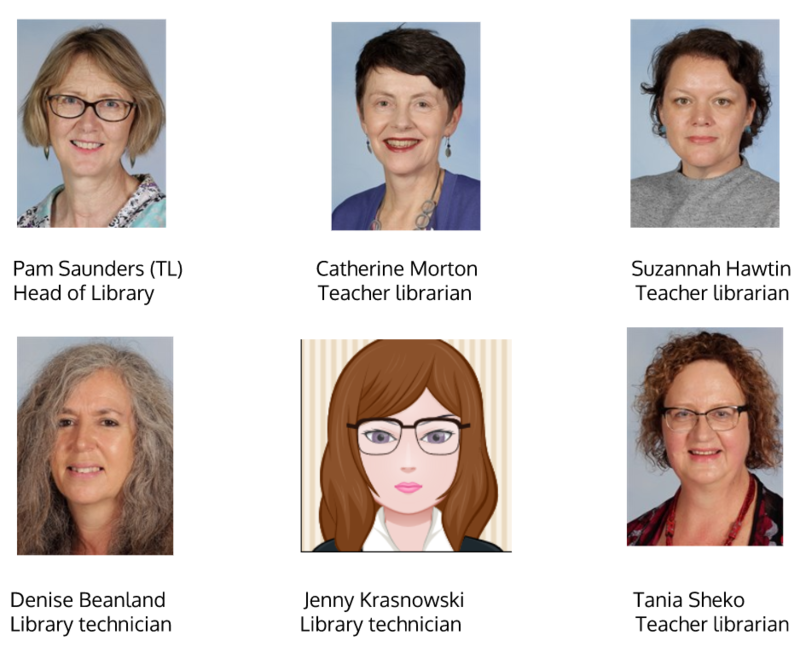 Catherine has driven school library vans in the Strathbogie Ranges and worked in public libraries where she connected readers to books and researchers to information. She shared the greatest and latest from Kinglake to Kew. Catherine also collaborated with young adult authors to present major literary events for students across Victoria. Her passions include peer coaching, technology integration and maintaining a personal learning network. She tweets as @melbhslibrary. When she’s not filling the stacks, you might find her walking by the Yarra River or playing flute in the Eltham Concert Band. Tania spends much of her time creating and capturing things online, then sharing with others, for example, in Libguides and Pinterest. She blogs at Melbourne High School Library and Art Does Matter. Tania runs a Writing Interest Group (WIG) which also has a blog. She and Suzannah are behind the MHS Library Instagram account. In a previous life Tania has taught English, German, French, Russian and English as a Second Language. Tania works with teachers and students to support English, English literature, English language, Studio Arts, Visual Communication Design, Sociology and Theatre Studies, and she teaches Personal Development. She's excited by art and storytelling, language and languages (speaks Russian and tried to learn Arabic at Uni but gave up), and asks too many questions. Jenny is responsible for the acquisitions and processing of print material so she is normally surrounded by books. She spends much of her time selecting and editing educational film resources for teachers and students on Clickview. She is famous for her knack of fixing things, and supports teacher librarians by finding online resources for them just when they're needed. Denise is an avid reader, and has a range of responsibilities including managing the magazine subscriptions and creating displays which enhance the library and attract passers-by with their attention to detail and innovative design. Most students will know Denise because she takes the time to ask them how they're going and chat a while. Denise is famous for putting on amazing morning teas. Her specialty is the role of Tiffin-Mistress at our annual Tea Duel.